The principle of this operation is stretching of skin diagonally upwards, and also of hypodermis, muscle fascia and muscles of the area of temples, lower jaw cheeks and outer 2/3 of the neck. The operation is performed under general anesthesia, lasts 90-120 minutes and requires a subsequent hospitalization of 24 hours. The resulting scar spans from the hairy part of the temples just above the auricle, then comes round the lobulus, continues behind the auricle and in the height of approx. 2/3 of the ear it merges into hair on the nape of the neck. The time required for surgical treatment is approx. 2 weeks, return to full load conditions with all risks is possible after 1 month from the operation. The classical operation is often combined with vibration-assisted tumescent liposuction of neck and double chin, in particular, with endoscopic resurfacing of the central third part of the neck. With use of endoscopic armamentarium and optical devices we treat the muscle tissue of this area and achieve thereby its stretching. 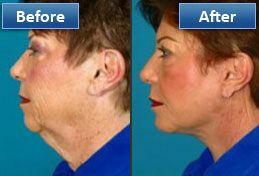 The final result of this process is a recovery of the natural angle and shape of the area in between the chin and the frontal part of the neck. The period of healing and convalescence is not changed as a result of such enhanced surgery.